Well, it's Saturday. Grammie camp is over today. The kiddo's Moms and Dads are coming today to pick them up this afternoon. We'll have a display of the arts and crafts that they did this week and we may even have a musical performance of a sort. I stitched out these badges and they'll be sewn on their blankets before they leave. 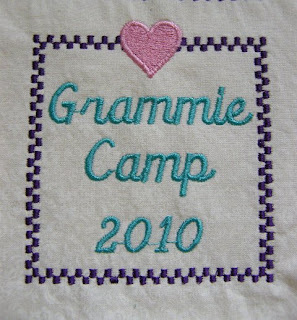 I never thought of it, but I should have done patches for my sister and Caileigh that said "I Survived Grammie Camp 2010". Great idea! What a wonderful way for them to leave Grammie camp. 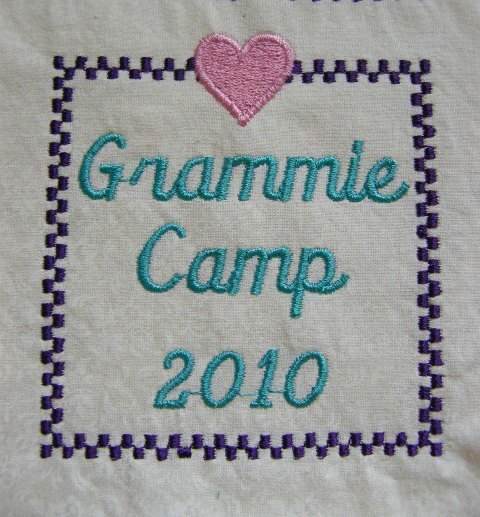 Grammie Camp sounds like such a great idea! Good for you for doing this. And I love the labels/patches you made. I meant to mention that "survival" thing about Grammie Camp...tee hee!